It’s one thing to talk about voting blocs on the Supreme Court — four conservative justices, four moderate-to-liberal ones and Anthony Kennedy in between, swinging back and forth like a pendulum. It’s another to see the actual voting patterns at work. 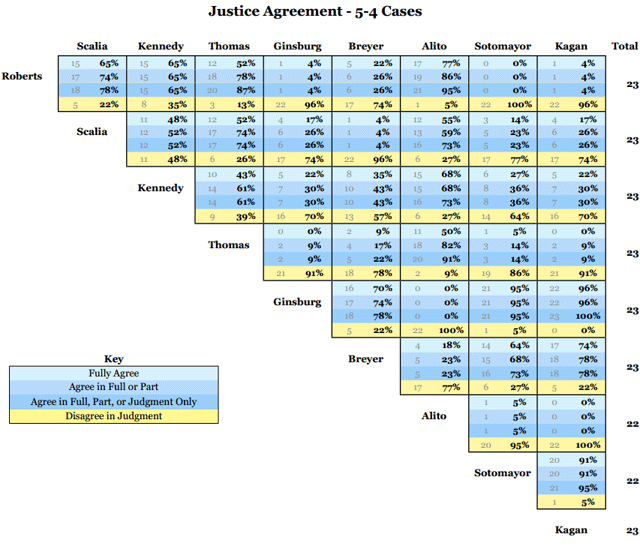 As the chart shows, Justices Ginsberg and Kagan not only agreed with each other in every 5-4 case, but both also disagreed with Justice Alito on every single one. Chief Justice Roberts and Justice Sotomayor also found themselves on opposite sides of every 5-4 decision. It also shows that Kennedy, the Court’s acknowledged “swing vote,” was more likely to agree with the Court’s four most conservative justices (ranging from 52% to 73% agreement in the 5-4 decisions) than the moderate-to-liberal ones (30% to 43%). Want to suggest a future Chart of the Week? Tweet us.